Subscribe for $20 a year! Looking for a copy of Walnut Creek Magazine? If you can’t find us at one of the 100+ retail and business locations that distribute our free city magazine, you can read Walnut Creek Magazine online or subscribe and have it delivered to your home. 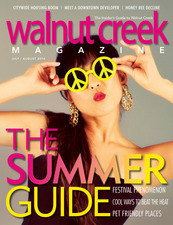 Subscribe now and receive 6 copies of Walnut Creek Magazine each year for $20.